Note: I sliced on the thinnest setting my mandoline offers. If you do not have a mandolin, do not fret. Slice as thinly and as uniformly as you can, and boil a little longer. After the slices are boiled, they should almost be translucent. Just use tongs to occasionally turn over in the pot, so they are all being cooked evenly. The more translucent, the crunchier they are. Here is a picture for reference. * Image originates from recipe site listed below. Preheat oven to 350 F. Place a wire rack inside of a rimmed baking sheet and spray the rack lightly with nonstick cooking spray. Cut the apple into very thin slices (about 1/16-inch, I used a mandoline). You don’t need to worry about coring or peeling the apple, though you’ll want to remove any seeds from the slices. Bake the apples for about 15-20 minutes, or until they’re golden in color. The baking time will vary depending on the thickness of your apple slices – I found the best indicator of doneness to be color. Don’t be concerned if the slices aren’t crisp when they become golden – mine definitely weren’t – the chips will crisp as they cool. 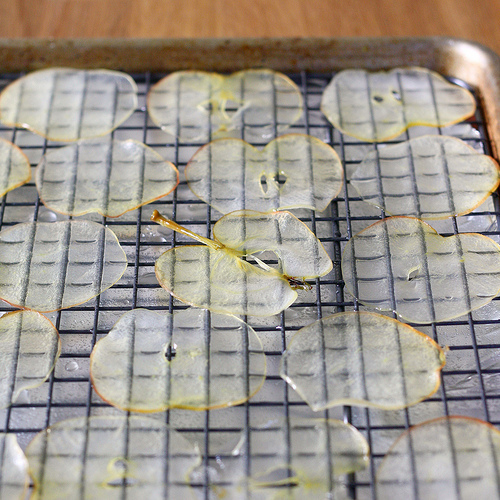 Transfer the chips to a sheet of waxed paper lightly coated with nonstick cooking spray and let them cool completely, it’ll only take about 10 minutes. Brooke, awesome recipe! 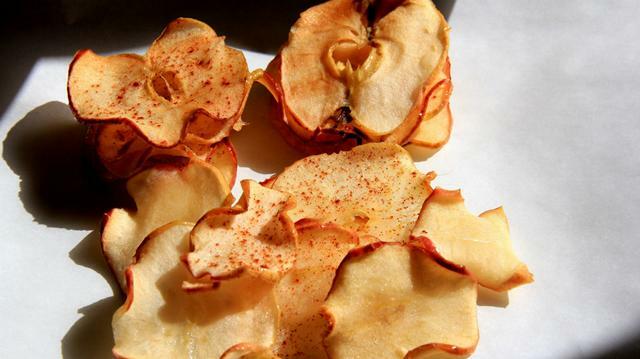 Linley helped me make these apple chips is morning! You forgot to remind us clumsy folk to watch our fingers on the mandoline! Oops!